Intellect Outsource avails premium quality responsive website design services. We craft websites with alluring aesthetics, remarkable coding and compelling content. If you are looking forward to create responsive website for your business, we are the best people to associate with. Achieving extraordinary results for our customers is what we always perspire for. Is your design as per the Google recommendations? Are you experiencing the undermentioned issues? Drop in search result ranks? No more worries! 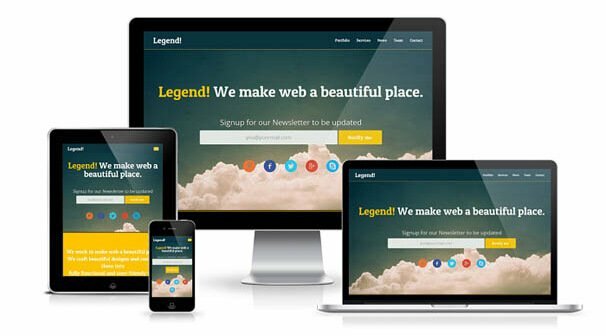 Our responsive website design templates that are specifically custom-made for your business can help immensely. Does your business actually needs responsive website designs? Well! To answer this question, you must firstly carry out a self-analysis. What is the type of your business? Who are your target audience? If you are focussing on the younger audience who browse through handheld devices like smartphones, responsive website template is something that you must not shun away from. You can rely on your Google analytics to understand the patterns of audience visits via browsers and OS. If you find that, you are getting a considerable audience from mobile devices, wait no more. Another thing to consider is that Google is nowadays sending mails to all those with unresponsive websites which is a signal that the Google algorithms will severely affect rankings of those sites that are not having responsive design. From reliable sources, it was recently revealed that in the near future itself, the number of mobile browsers will supersede those in front of desktops. So, the fact is that without having a responsive website providing best user-experience on mobile devices, your business will find itself on the slippery edge. Intellect outsource is equipped with trained professionals who remain well acquainted with the updates in mobile industry. They keep keen eyes on the latest arrivals in the market. Also they understand even the slightest moves made by Google and leverage the insights for your benefit when it comes to responsive website creation services. The team here is capable of designing for all screen sizes of different devices from major brands. Website functionality is checked in actual devices. We also ensure shortest loading time. For the purpose, different devices of varying screen resolutions and sizes are used. Compatibility with all major browsers like Chrome, Mozilla Firefox, Safari, Internet Explorer 9, Opera and Android browsers are assured. Our team guarantee better navigation, apex level of performance and great user-friendliness. We not just indulge in response website designing services from the scratch. In case if you have a great website but it is not responsive, leave the burden to us. Our experts will incorporate the property of responsiveness into it. We have all those tools as well technologies for assuring seamless responsiveness to your website. Media queries, flexible grid based layouts that use re-sizing, and flexible images & media etc. are just a few to mention. Request a free consultation today itself! Our team is available throughout day and night to assist you. For placing an order, contact us anytime. The rates we offer are affordable and services by us are the best in the industry. Considering every customer as our precious asset, we offer perfect and customized solutions for you.